← who chewed the hose? 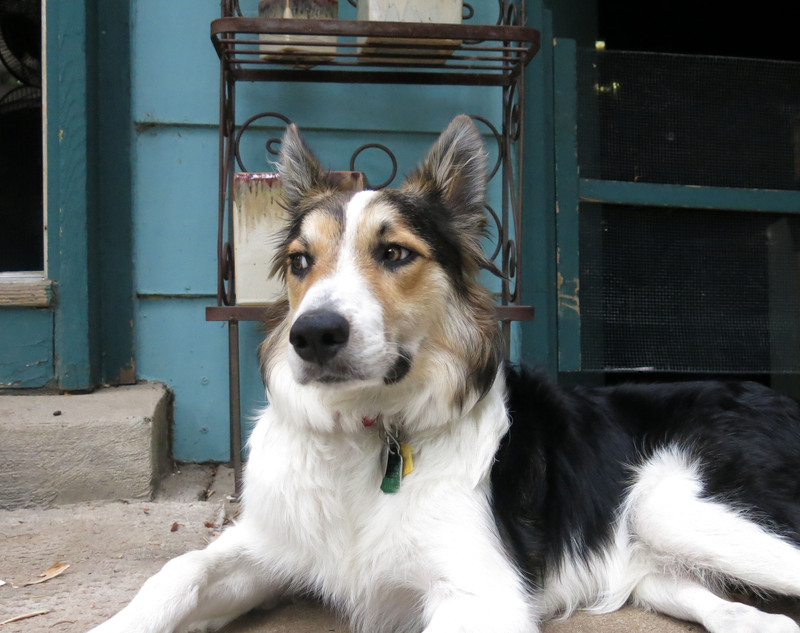 Greetings and salutations, everyone; yes, once again it is I, Mani the tiny purebred border collie, though really I’m not all that tiny and am kind of huge, filling in for the guy I live with, and here to bring you the latest and greatest news from our garden. You may remember me from such posts as “The Star Student”, among so many, many others. Here I am in a characteristic pose. Ears slightly back, as you may notice. Rather noble, don’t you think? Maybe you’d like to see another picture of me, looking kind of wistful or something. Once again, not much has been going on, but in the middle of all this nothing going on, the guy I live with decided to fix the fence on the south side of the house. This meant moving six or seven troughs, each of which, he claimed, weighed three hundred pounds, and he moved them all without running over my feet. Amazing, huh. The troughs had been there for years, all in a row, on cinder blocks, but the guy I live with said they were too hard to keep watered, and the fence was leaning over them so much that it looked completely ridiculous. He put up a four-by-four but couldn’t get it completely upright, so it leans a little, too. He said that was okay. All the pickets were falling to pieces and so they got replaced. The guy I live with said that the fence work done in this neighborhood, when it was built way back when, was not exactly quality work. There’s going to be a garden there, now. This area is unbearably hot in the summer. Today he put in another four-by-four and this one is completely upright. I know, because I made sure it was. The guy I live with says that autumn is drawing, well, he said “nigh”, but I think he means closer. I don’t know what “autumn” is. I guess I’ll find out. I hope it’s nothing scary. 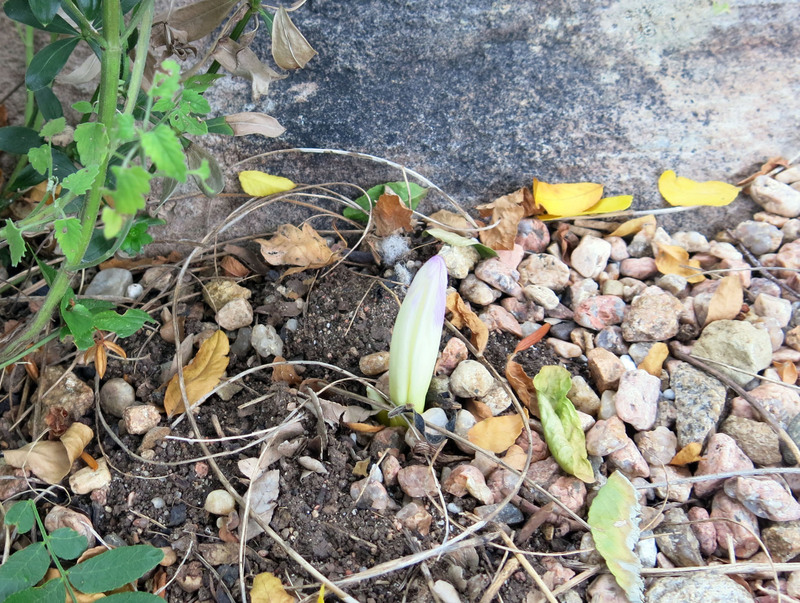 The first colchicum: And of course I’ve been going on my walks. That’s me on the end of the long leash, if you didn’t know. I like to make a game of trying to get the walking harness on, which the guy I live with finds moderately annoying, so of course it’s fun. 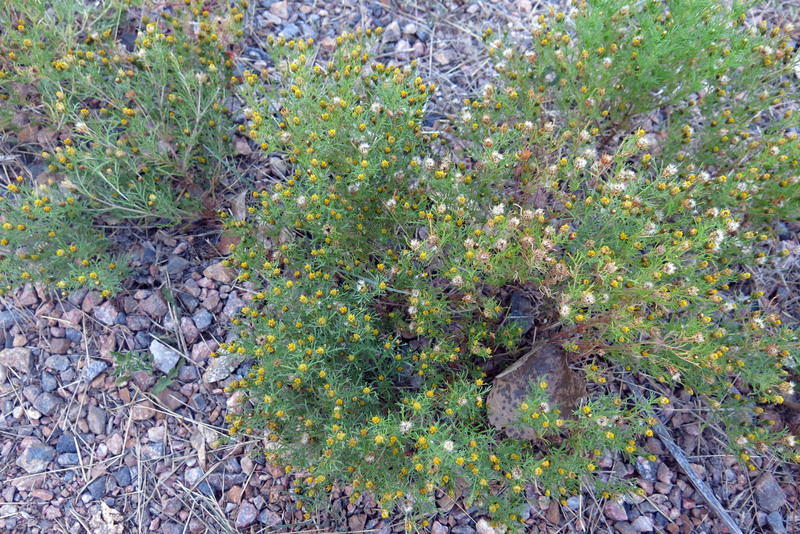 On one part of our walk is the native marigold, Dyssodia papposa. It’s not much to look at, but the guy I live with says it smells just like a marigold. He likes the smell of marigolds. 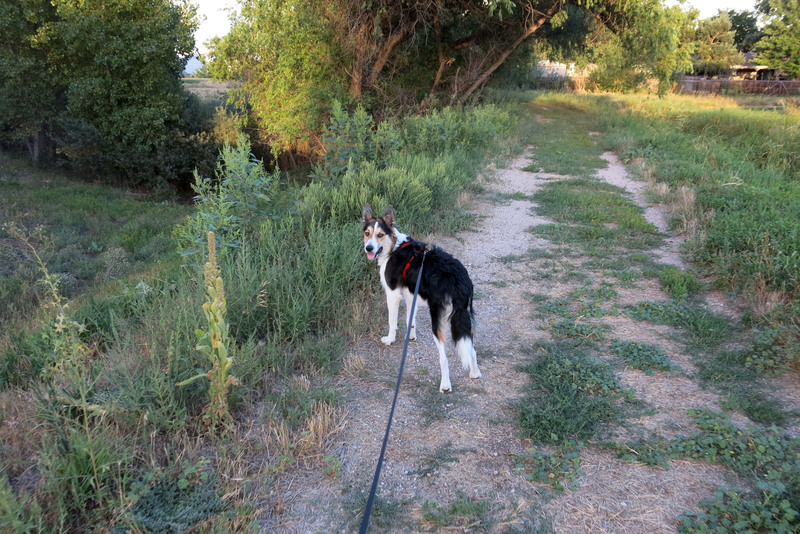 The guy I live with says that he used to walk down the creek path with the border collie who lived here before me, whose name was Chess (maybe you knew him), but that last summer they didn’t walk there very much, and so the trail is overgrown, but that when the grass dries down we’ll blaze a new trail, so I can walk all the way down and back. It sounds pretty good to me. I’ve been part way down, but it was hard to walk, because of all the grass. There was water in the creek for a while this spring, and I got to splash in it. 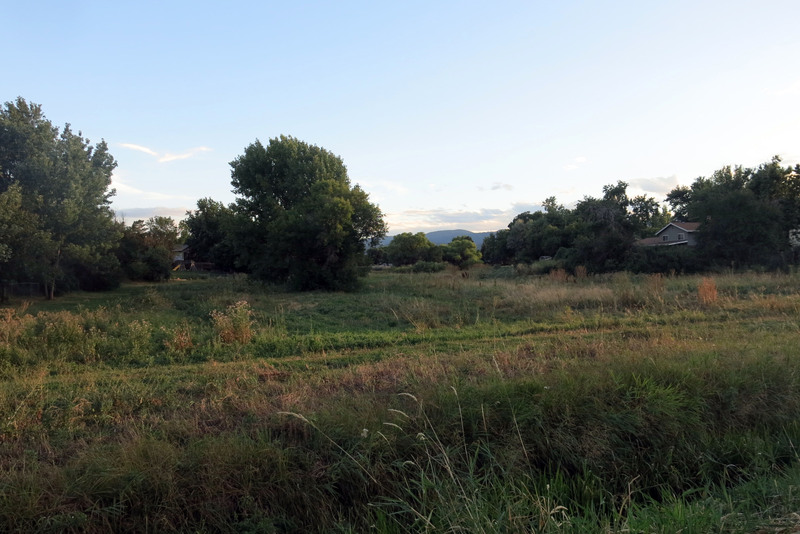 The creek is on the left, and winds behind that first tree there, and then goes south. It comes from the mountains. I guess that’s it for today. You can see that the guy I live with has been really busy, which is good, because otherwise he says his mind will start to crumble, and I wouldn’t want that. I’ve been equally busy, but doing other stuff. 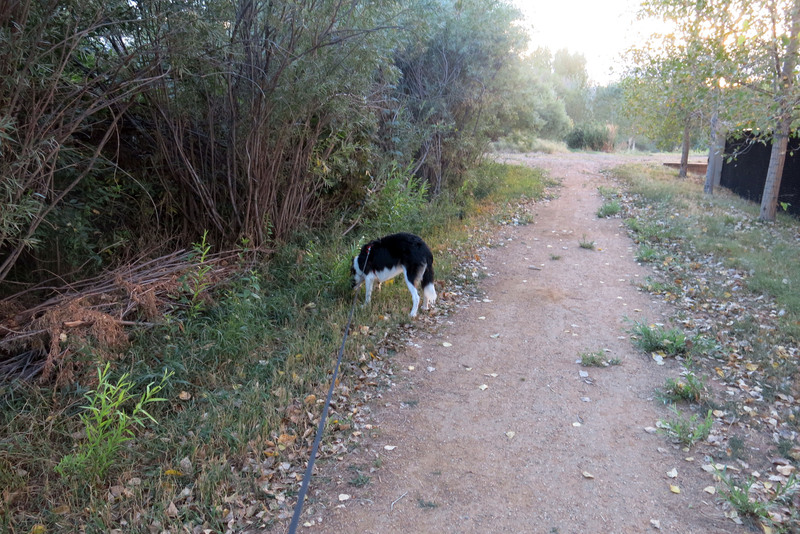 You know, the kind of stuff you would do if you were an eight-month-old purebred border collie. This entry was posted in Uncategorized and tagged Dyssodia papposa. Bookmark the permalink. Wow Mani 8 months old already, it’ll be your 1st birthday before you know it and there will be cake, dog cake that is, maybe people cake too and presents. In that second pic you look like your plotting to me. 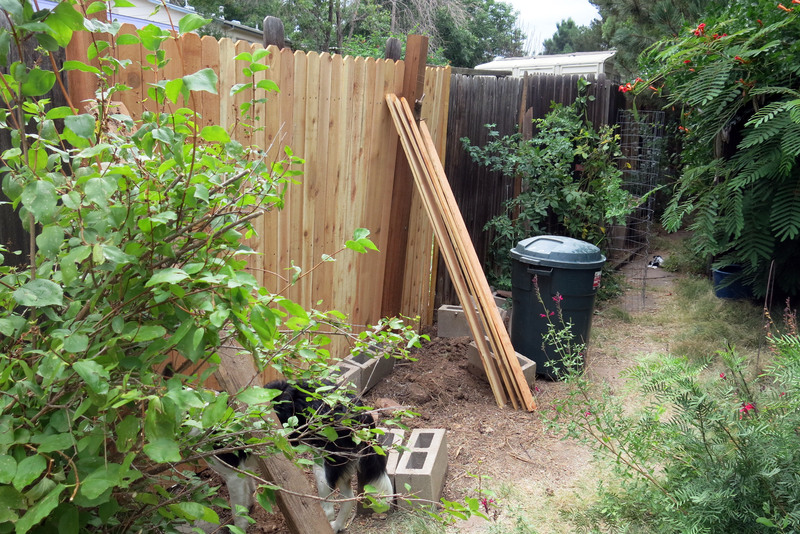 Your guy does a really nice fence too good you approve and a new garden to tear up soon. Yes, I can hardly wait to go tearing through the new garden. There’s a sort of fence there now (you can see it behind the trash can), but my understanding is that I’ll be allowed to go in there after the work is done. There was this big spiny cactus there that bunnies used to hide behind, and I stuck my nose in there one too many times, without getting stuck, on my nose I mean, and so the guy I live with, instead of not letting me go in there, took out the cactus instead. I didn’t know there was such a thing as dog cake. I’m going to have to check that out. Mani, tell TGYLW there are lots of dog cake recipes on youtube. Also thank him for IDing the native marigold. It is coming up all over in my backyard. Sure; it’s very marigold-y. Not much to look at otherwise, though. Eastern Colorado Wildflowers is a pretty good site for identifying stuff. Flowers, anyway. The guy I live with says there’s a place that bakes cakes for dogs. Possibly even more than one. I don’t really know what a cake is, but I like the sound of it already. Mani you are becoming quite huge, your puppy days might run off when autumn comes nigh… but don’t be scared, it’s really not as scary as it sounds (although I’m not a fan). Fall is good walking weather though, and I thin you’ll enjoy that immensely. Thanks; the guy I live with says we are into the dry season here, and that autumn is usually super dry, but that also, and get this, the first recorded snowfall for Denver is next Thursday. That would be excellent. For me, anyway. Mani you are walking in noble footsteps and I hope when you blaze your trail there is still a faint scent of the one who came before. Is TGYLW going to plant up those empty 300 lb troughs? I hope so. I know I dwell on the troughs a lot, but I do like them. 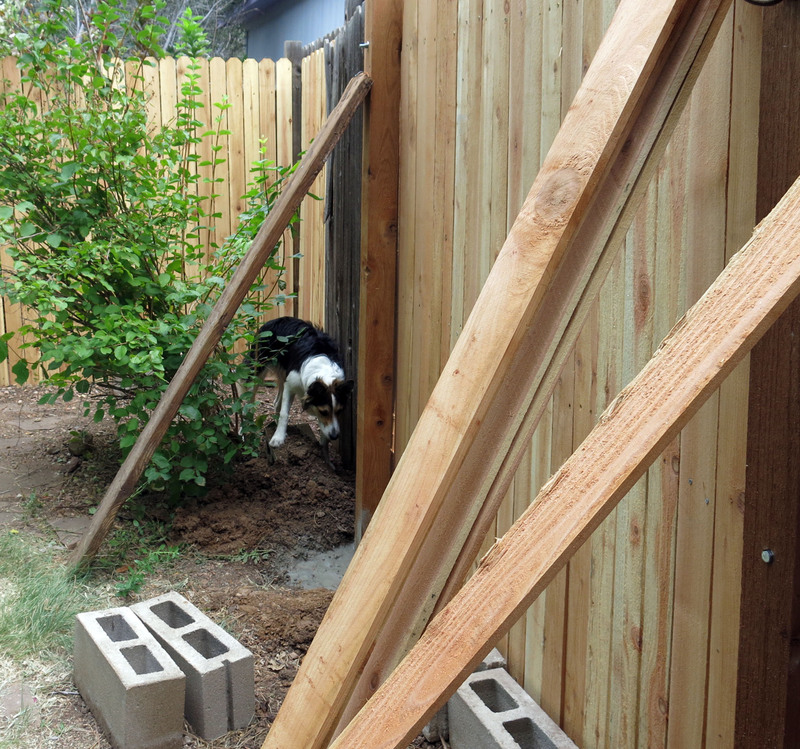 Boy, do we ever know about shoddy fences. When the subdivision behind us was built the mayor was too busy lining his pockets to remind the builders that good fences make good neighbors. Plus, the entire subdivision empties onto our street. It must be very nice to walk in that open space. Indeed, I get the sense that this has all been done before. I can hardly wait for winter, that’s for sure. The guy I live with says that the troughs are going to be planted mostly with stuff grown from seed; I guess from Alplains. There aren’t any seedlings for this year; this is the time to plant them. A whole bunch of seedlings have gone to DBG already. I hear that some of the fence posts here were sunk to a depth of six inches. Impressive, no? Good fences do make good neighbors. The guy I live with’s ideal fence would have giant fans on top, to blow the fumes from laundry detergent, body spray, pesticides, and other icky things back where they belong. I’d have them all along the front, to keep out the diesel exhaust! How come the people who create the noise and bad smells always get the world their way? That’s a good question. In winter the back yard here is very diesel-y, from the highway just to the north of us. Dog cake! you have yumminess in store, Mani. 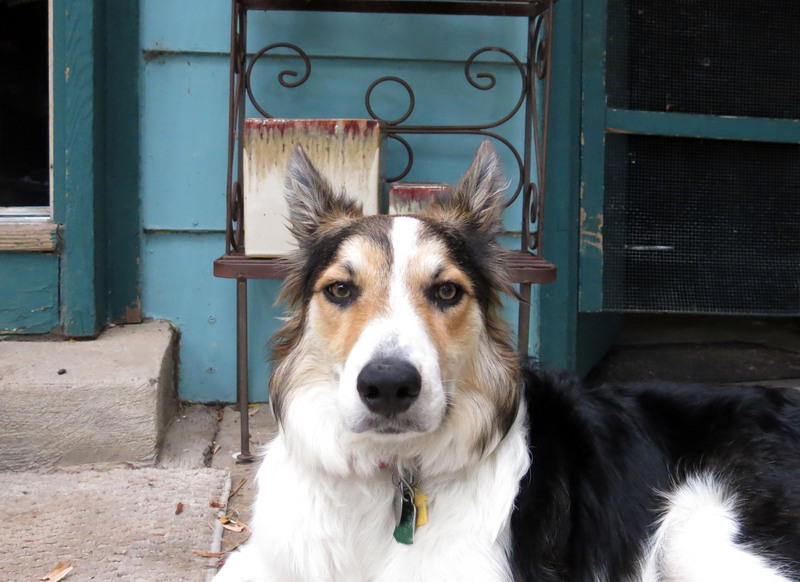 Our dogs can tell you all about dog cookies, which come to them from the high-end bakery at the other end of town (a whole mile away), fifty cents each for a pretty large bone-shaped cookie. Peanut butter is involved, and Petey and Shredder sniff we’re carrying treats as soon as we enter the house. If you’re going to be supervising fence building and eluding moving troughs, you’ll need to keep your strength up. Cake is just the thing. Well, and brie. It does look like you’re taking autumn walks, Mani, and how can that be? High summer still rules where we are. Our dogs play dodge-the-harness too. Great fun is had by all. I bet The Guy You Live With has discovered stores of patience he didn’t know he possessed. Yes, it’s true; the guy I live with is extraordinarily patient when I play Try To Get It On Me. maybe because he always wins. All of the fence work and trough moving is done. For now, anyway. It has become cooler here, but otherwise pretty much the same weather every day. Sometimes it clouds up in the afternoon, but nothing happens. There isn’t any wind. The guy I live with says we haven’t had a windy day, where storms weren’t involved, in years. Peanut butter anything sounds pretty excellent. I get peanut butter treats. Newman’s Own; really, really, really, good.